Be your own professional makeup artist with Maybelline's full coverage 24H foundation. Saturated color pigments provide an ultra-transforming effect in this long-lasting foundation. The lightweight, yet high-impact coverage formula glides onto the skin for a flawless finish that lasts all day. 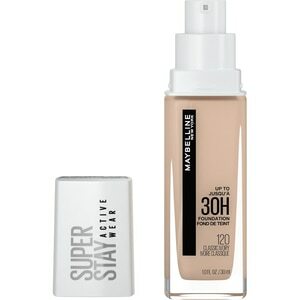 Maybelline Super Stay Full Coverage Foundation, Classic Ivory. Apply to the face and blend with fingertip, sponge, or Maybelline Blender. For external use only. Do not use on damaged or broken skin. When using this product, keep out of eyes. Rinse with water to remove. Stop use and ask a doctor if rash occurs. Keep out of reach of children. If swallowed, get medical help or contact a poison control center right away.